March 2013 has closed out the record books with a monthly high temperature in Washington of 63°. This is the coldest high for March since the 58° in 1958. 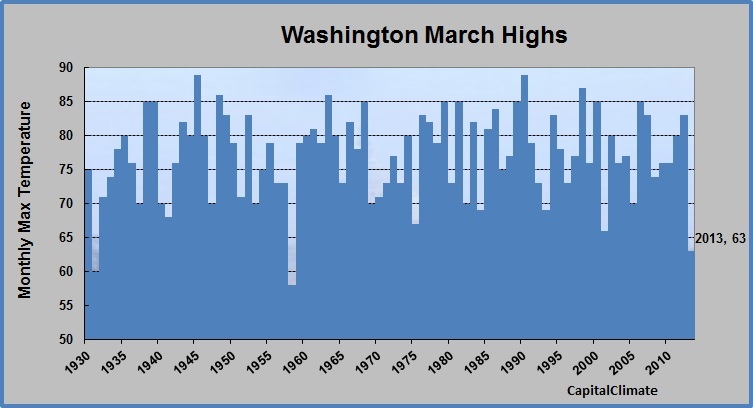 It's only the second time Washington has failed to reach 65° in March since the 60° high in 1931. The unofficial monthly average of 43.8°, however, was only 3.0° below normal, making this the 55th coldest March since temperature records began in 1871.